Size: 90 x 90 cm. Medium - Diasec-mounted giclée print on aluminium panel. This edition was taken from Hirsts Colour Space Paintings (2018), a body of work that evolved from the iconic Spot Paintings, which are among Hirsts most recognisable works. Please have a look at my other items. Any questions please do not hesitate to ask. 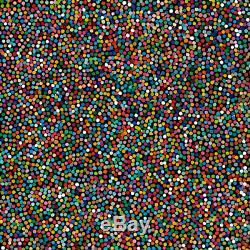 The item "DAMIEN HIRST H5-8 Signed and Numbered Limited Edition Print" is in sale since Wednesday, October 24, 2018. This item is in the category "Art\Art Prints". The seller is "abc-art" and is located in Ruislip. This item can be shipped worldwide.